Why Are Beagles in Labs? Beagles are frequently used for toxicity testing to generate data for federal regulatory agencies. Many of the regulations that require the use of animals were written decades ago, and do not reflect the fact that new, modern alternatives have been developed. Animals are still poisoned and killed in these tests, despite the fact that the FDA itself has reported that 92% of drugs that were shown safe and effective in animals later fail in human clinical trials, sometimes with harmful and deadly consequences. Just three companies – Marshall Farms (North Rose, NY), Covance (Cumberland, VA), and Ridglan (Mt. 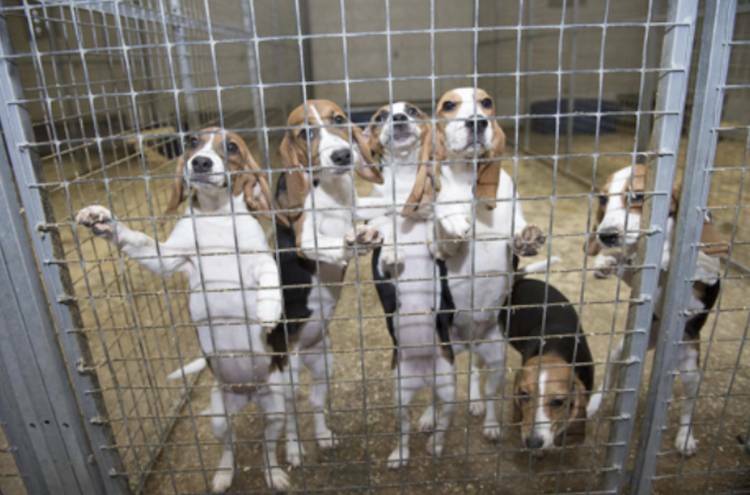 Horeb, WI) – supply the majority of beagles used in animal testing. These companies “cull” any beagles who have “unacceptable physical, physiological, and behavioral characteristics,” and sell thousands of others for use in cruel and archaic experiments. These companies make a tremendous profit off selling and shipping live beagles to laboratories all around the world. Tragically, very few of these 60,979 dogs will ever feel the grass beneath their feet or an affectionate pet from a family who loves them. Most beagles in laboratories are not even given names. Rather, an identification number is tattooed on the inside of their ear like a UPC code. The experimenters view them as nothing more than a piece of laboratory equipment. IIn nearly every state, animal cruelty laws have an explicit exemption for activities that occur in a research laboratory. This means that acts that would get some arrested and criminally prosecuted for cruelty-to-animals are perfectly legal, so long as the abuser wears a white lab coat and carries out their cruelty in a laboratory. And the only federal law which governs the use of animals in laboratories, the Animal Welfare Act (AWA), states explicitly that it is not intended to interfere with the “actual research or experimentation by a research facility as determined by such research facility.” As long as basic housekeeping requirements are met, like food, water, and a clean cage, anything goes in a laboratory. There is no such thing as an illegal experiment. The AWA does have some minimum cage size and exercise requirements. However, as long as beagles are confined to a cage twice the legal minimum, the regulations consider that “adequate” exercise. 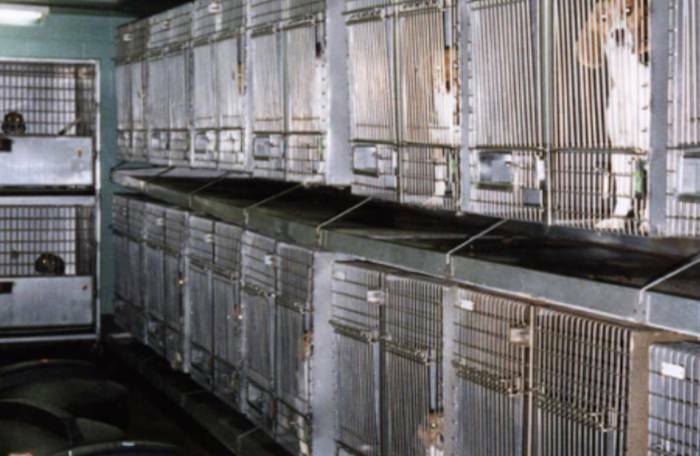 This means that the vast majority of beagles in laboratories live in tiny stainless steel boxes for their entire lives. Here is an example of a “roomy” cage that is twice the square footage requirement, allowing the laboratory to never take this dog for a walk. In the United States, the largest users of dogs in testing are three “contract research” laboratories in the United States – MPI Research in Mattawan, MI (5,000 dogs/year), Covance in Madison, WI (4,000 dogs/year), and WIL Laboratories in Ashland, OH (2,100 dogs/year). These companies are “laboratories for hire,” and will carry out whatever tests on animals the sponsor of the study wishes. Beagles are frequently used in toxicity experiments, where an experimental drug or compound is either injected into their bodies or forced down their throat, a crude procedure known as a “gavage.” At the end of these tests, all of the dogs are often killed so their organs can be removed and examined for damage. Very few, if any, of the dogs used in these laboratories make it out alive. Beagles are also sold to universities around the country for use in “basic research,” which are experiments carried out for the purpose of securing federal research grants and publishing academic papers. Of the research universities, University of Illinois (694 dogs), Louisiana State University (527 dogs), and the University of Missouri (287 dogs) use the most beagles in testing. At universities, dogs are frequently used in deadly heart failure experiments. As part of these experiments, devices are implanted onto the dogs’ hearts and into the arteries and veins in their chest and abdominal cavity. The beagles often wear a “jacket” to keep all of the instrumentation in place. These instruments induce “pacing,” which is a condition where the the heart beats incredibly fast. This causes hypertension, heart failure, and eventually, cardiac failure and death. 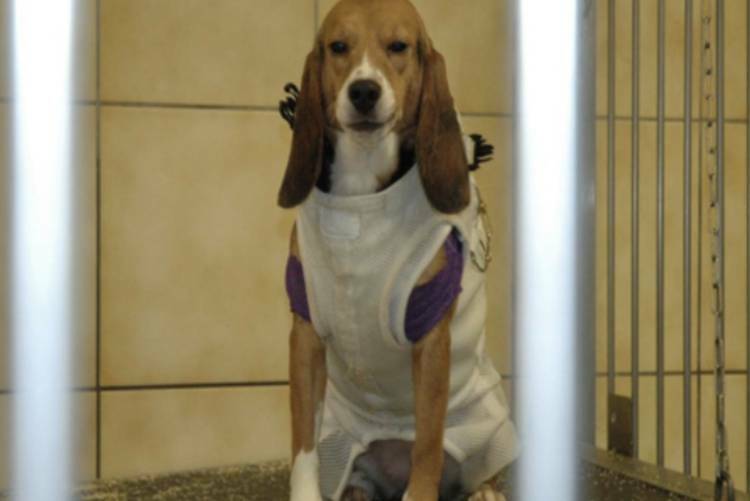 Records received by Beagle Freedom Project indicate that as many as one-fourth of the dogs used in these types of tests die before they can even complete the experimental protocol. Beagles are frequently used for toxicity testing to generate data for federal regulatory agencies. Many of the regulations that require the use of animals were written decades ago, and do not reflect the fact that new, modern alternatives have been developed. Animals are still poisoned and killed in these tests, despite the fact that the FDA itself has reported that 92% of drugs that were shown safe and effective in animals later fail in human clinical trials, sometimes with harmful and deadly consequences. Tobacco corporations were able to delay the widespread recognition of the health problems associated with smoking by pointing to tests it carried out on beagles and other animals. Although epidemiological studies showed a clear association between lung cancer and smoking in humans, experimenters were unable to reproduce these cancers in laboratory animals. It was in the 1950’s that laboratories first started commonly using beagles in testing and experimentation, and the 1960’s that many of the archaic regulations requiring their use were first put in place. Our technological capabilities have come very far since then, and better methods now exist for testing the safety and efficacy of drugs and other products. Researchers at Harvard are now engineering microchips to simulate the functions of human organs, and other research teams across the country are conducting similar pioneering research, some of them with BFP’s financial support. It’s time we invest seriously in these alternative methods and empty the laboratory cages.